Training Program Director: Matthew J. Weiss, M.D., F.A.C.S. The combined Johns Hopkins Medical Institutions represent one of the world’s largest private non-profit medical centers. 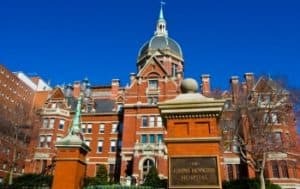 The medical institutions consist of the Johns Hopkins Hospital, The Sidney Kimmel Comprehensive Cancer Center, and the Bloomberg School of Public Health; all of which are located on the same campus in East Baltimore. The Johns Hopkins Hospital is a 1,000-bed tertiary/quaternary care facility with 45 operating rooms, 40,000 annual admissions and 26,000 operations per year. More than 5,000 cancer cases are seen per year at Johns Hopkins, of which more than 70% are treated surgically. The Sidney Kimmel Comprehensive Cancer Center has more than 100 faculty members dedicated to caring for cancer patients and studying the basic mechanisms underlying this disease. The center incorporates numerous cancer specialty centers and clinics. The Johns Hopkins Surgical Oncology program consists of a two-year, post-residency fellowship and accepts two fellows per year. Each are designated to one of two tracks, depending on the interest of the applicant: (1) General/Research and (2) Hepatopancreaticobiliary (HPB). Qualified applicants are interviewed, ranked, and accepted through the SSO national match as two separate positions. The first year for both fellows is composed of core rotations. Specifically, the trainee rotates on three gastrointestinal/HPB oncology services (16 weeks), colorectal (4 weeks), breast (4 weeks), melanoma/sarcoma (4 weeks), head and neck (4 weeks), thoracic (4 weeks), endocrine surgery (4 weeks), medical oncology (4 weeks), and radiation oncology (4 weeks) services. For the General/Research fellow, the second year is designed as an elective year in order to optimally accommodate the specific interests of the trainee. This fellow will have the opportunity to enter an advanced research track for either laboratory or clinical sciences, with an option for a third year. This training period includes formal training tailored to individual interests and capabilities. The clinical research track offers enrollment in advanced studies through the Graduate Training Program in Clinical Investigation, in which either Masters or PhD programs may be pursued. The laboratory training program also takes advantage of the tremendous environment for basic and translational research provided by the NCI-funded Sidney Kimmel Comprehensive Cancer Center. This fellow also has an opportunity to gain additional clinical experience in specific core surgical services, as well as elective clinical rotations. The HPB-designated fellow devotes the second year to a clinical focus in this field. Experience on high-volume surgical rotations in HPB surgery is provided as well as the opportunity for elective rotations in interventional radiology and liver transplantation. Participation in a wealth of ongoing research in HPB oncology is available and encouraged. Both senior fellows will be offered core training in clinical cancer research. The trainee will participate in formal courses through the Johns Hopkins Bloomberg School of Public Health, including (1) design of clinical studies, (2) quantitative analysis of clinical data, (3) outcomes research, and (4) ethical and regulatory issues in clinical research. Early in the fellowship, each trainee will be guided to choose a senior preceptor/mentor from our list of participating surgical faculty, all of whom have demonstrated an outstanding record of cancer research and successful trainee mentorship. The fellow will be expected to participate in, design, and conduct clinical research during their training. In addition, electives courses are available for the trainee in the Johns Hopkins Business of Medicine program. The didactic educational program offers a variety of conferences for the fellow to attend and encourages active participation throughout the training period. Weekly meetings include a multidisciplinary surgical oncology conference and a surgical oncology fellows conference. Other conferences consist of surgical and oncologic research conferences, disease-specific multidisciplinary management conferences, Surgical Grand Rounds, and Oncology Grand Rounds. The program is designed to generate a highly selected group of surgical oncologists who will provide academic leadership for the 21st century. Qualified applicants are encouraged to contact the Program Director or the Fellowship Coordinator for additional information. Applications are accepted through the SSO Website. Completion of general surgical training in the U.S. or Canada is required. Interviews will be by invitation sent by email in mid-July. They will be held in late August or early September. Fellowship Training Program Director: Matthew J. Weiss, M.D., F.A.C.S.